Don’t become a victim of lock snapping (see our earlier posts and videos). 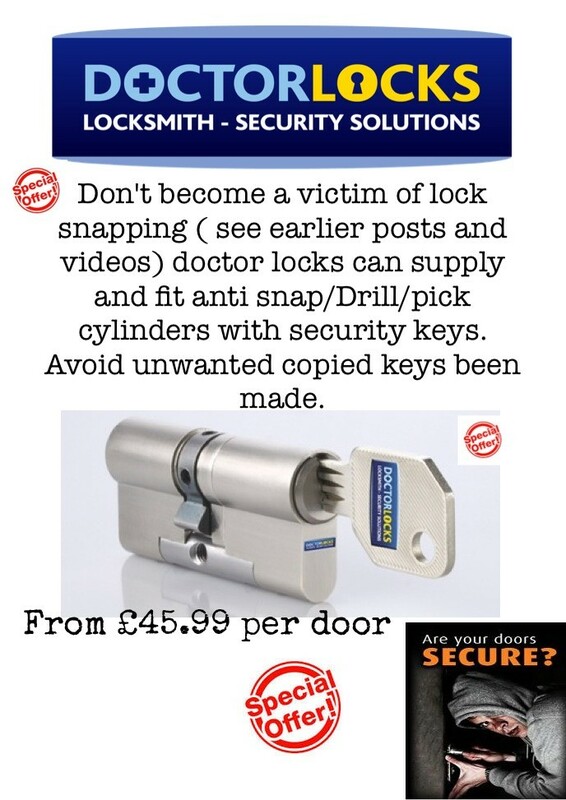 Doctor Locks can supply and fit anti-snap/drill/pick cylinders with security keys to avoid any unwanted copied keys being made. Lock snapping is by far the number one choice for many burglars looking to gain entry into a home. A lock can be ‘snapped’ in well under a minute. Forget how good the rest of the door locking system is if the cylinder lock can easily be snapped, pushed through and the door opened. Doctor Locks replaces the older style euro-cylinders with anti-snap locks for complete piece of mind and full security. Posted in Latest News, Special Offers.